The island of Anglesey, jutting out the way it does, into the Irish Sea, has suffered numerous shipwrecks on its shores over the centuries. The one most people remember is that of the Royal Charter, which sank in the Moelfre Sound on its way back to Liverpool from Australia. Four hundred and fifty poor souls lost their lives that night in a dreadful storm. However, according to local records, there have also been a hundred and more other wrecks scattered around its rocky coastline. These may have been on a much smaller scale, comparatively speaking, but each one was just as tragic for those involved. One such example was that of the Rothsay Castle in 1831, which had a connection with the town of Beaumaris. This tale begins in the port of Liverpool. Ship owners there, always with an eye for profit, were keen to establish a popular sea run, from Merseyside to Beaumaris on Anglesey. In 1831, Beaumaris was considered to be a very fashionable watering place for the well-heeled middle classes. It had imposing buildings overlooking the Menai Strait, a medieval castle in the town itself, other impressive mansions nearby and an attractive green bordering the sea front, which was ideal for strolling about admiring the views and displaying the very latest in dress fashions. The only drawback was that Beaumaris had no purpose-built landing place, although it was the most used port on the island. Remember, Holyhead was only in its infancy at the time. So, every visiting ship had to anchor at the mouth of the Menai Straits and offload its passengers into small boats. In rough weather, this could be quite an experience. The Rothsay Castle had been purchased by a Liverpool business man called Watson. She was a steam driven paddle steamer of around 200 tons, and used, in the first place, to operate on the Clyde in Scotland between Glasgow and Inverary. So, she was really a river boat and, therefore, not built to withstand the rigours of the Irish Sea at its worst. She was, also, over 19 years of age, which by the standards set by the Royal Navy, made her unfit for more active sea service. Her 50 horse-power engine was well worn and some of her timbers only four inches thick in places, and riddled with woodworm. There was just one lifeboat which could hold 16 people. It was, also said, that she carried no distress signal, no rocket, blue light, or even a lantern. She had just one distress gun aboard - an ancient fowling piece. Yet, despite all this, Watson had already attempted to use her as a packet plying between Liverpool and Wexford in Ireland. However, things went from bad to worse, and most of the crew signed off in alarm. That left just two experienced seamen when Watson decided to switch her on to the Liverpool to Beaumaris run. Inevitably, the scene seemed set for a disaster, and that she was destined to become a coffin ship. On the morning of 17th August, 1831, eager passengers flocked aboard the Rothsay Castle at the quayside in Liverpool. A motley crew had been hurriedly recruited for the voyage, but very few of them had experience. The Captain was a certain ex-Naval Lieutenant called Atkinson, who had not been long in the passenger ship service. The ship had been scheduled to leave at precisely 10am in order to catch the tide, but Atkinson delayed the sailing, hoping to attract more customers, thus pleasing the ship owner. It was not until nearly an hour later, when 93 passengers had boarded that he finally gave the order to depart. By the time the paddle steamer emerged from the Mersey out into the open sea, the weather had changed and the wind was rapidly strengthening into a full force gale. The ship rolled and reeled as it was battered by the tremendous waves, alarming the passengers even at this early stage. Almost as soon as they had left port, the Captain and the mate, William Vasnavour, had disappeared below to dine, and drink heavily. No one seemed to have been left in charge, and the crew appeared totally inefficient. at a very slow speed. At 3pm, the Captain did show his face briefly, above the deck, but when anxious passengers tried to accost him, in his drunken state, he was very insolent to them. It was another two hours before he reappeared again. By now, conditions on board were becoming horrific. Leakage through the timbers and the paddle wheel was increasing steadily. The bilge pumps were choked, the coals, in the hold, totally submerged and some of the ladies' cabins were awash with water. The stoker, with the assistance of a group of passengers, tried to keep the pumps going, but it was a useless task. The 50 mile sea run from Liverpool to Beaumaris should have taken between six and seven hours, but it had already taken two solid hours to pass between the two Ormes at Llandudno, and by 10pm the ship was only past Conway. An anchorage could have been found here to disembark the women and children, but the Captain refused even to consider the option and so the misery of the passengers continued. A sickly moon arose against a wild and stormy sky. At around 11pm, they were still managing to keep the pumps going, but conditions on board had deteriorated. Women passengers were becoming hysterical, and the children very frightened, and in need of comfort. The, a quarter of an hour later, land suddenly appeared off the starboard bow. It was Puffin Island. By midnight, two fires in the engine room had been extinguished, and the pumps became choked with ashes. There were no buckets on board, so most of the male passengers used their top hats for bailing. The ship had finally arrived at the mouth of the Menai Straits, with the tide running against her, and a head of steam so low that she could not keep on course. Helplessly, she drifted towards the huge sandbank called The Dutchman's Bank. Ordinarily this bank, at low tide, could have been quite easily negotiated, but conditions were not normal. There was help available at Port Penrhyn in Bangor, Penmon Point and even in the town of Beaumaris, but with no means of attracting attention by light, rocket or signal, no one was aware that a ship was in trouble. The old fowling piece had given up the ghost. Inevitably, the Rothsay Castle was driven hard into the Dutchman's Bank by the gale force wind. It was said that the ship struck the bank at least 50 times. At each impact, passengers were hurled into the sea. Many drowned. The Captain, now thoroughly concerned, tried to assure everybody that they were only on a sandbank and it was only a matter of waiting for low tide, but the impact of the crashing waves, plus complete and utter panic, cost even more lives. Sixteen passengers tried to launch the lifeboat but a huge wave swamped it, and it was washed up next day at Beaumaris, a total wreck. Another tremendous wave carried the Captain and his mate, Vasnavour, and 15 more passengers overboard to their deaths. Nobody on the land was aware of the calamity until dawn broke. Help was immediately launched, but of the original 93 passengers, only 23 survived. Their plight won much sympathy from the townspeople of Beaumaris. The local MP and landowner, Sir Richard Williams Bulkeley, raised funds for the survivors and for the burying of the dead. He sent his workers to look for bodies washed up on the mainland of Conway, Penmaenmawr and Llanfairfechan. An inquest was held on the tragedy, at which the owner of the Rothsay Castle, Watson, had a very rough reception, but he seemed totally unmoved. "From the evidence brought before them, the Jury must declare their firm conviction that had the Rothsay Castle been a seaworthy vessel and properly manned, this awful calamity might have been averted. They, therefore, cannot control their indignation at the conduct of those who could place such a vessel on this station, and under the charge of of a Captain and Mate, who have been proved, by the evidence brought them, to have been in a state of intoxication." A large number of passengers on the vessel - well over 20 people - were on an outing from New Road Church in Bury, Lancashire. There used to be a commemoration stone in the yard next to the church. The stone disappeared when the church was demolished a number of years ago. Hello, I commented in July 2015 and November 2015. Does anyone please know where I can get a copy of a poem, in Welsh, about the tragedy by Rev. William Williams? As I said earlier I am descended for the Hammonds who were on the voyage, Harriett drowned and George survived. Please let me know if possible on hodbob at Hotmail dot co dot uk. The "Rothsey castle" ship ''for sale in 1828 reveals a ship that far too long later, was entirely unfit to be at sea. Even the old "HMS Conway" ( formerly HMS Nile.) was towed from near Menai Bridge by forceful tugs was built in 1828, the towing process saw the towlines break and the ship ran into the banks, breaking its keel, near the Menai Bridge and then caught fire at a later date..All of which can be seen photographically on google images..phase by phase. I posted the link below copy and pace into you browser. Since commenting in July 2014 I have visited the area and seen graves and memorials in Beaumaris and Penmon churches. The library at Beaumaris has reference books with further information. The coastguard at Penmon was very helpful and pointed out Dutchman's Bank which is easily visible at low tide. The picture depicting the sinking of the Rothsay Castle is superb. I would like to know more on the person who drew this picture. I am much interested in arts and drawing and would like to buy this picture. Please reply. My G g g grandfather, George Hammond a flax spinner from Leeds, was a survivor but his wife, Harriet, drowned. She was brought back to Leeds to be buried. Their son Samuel went on to marry and eventually I came along. George's description of the accident and his efforts to survive with his wife is in the book mentioned in the article. I would be interested to hear from anyone with knowledge of memorials, etc. Here is the Internet Archive address to download the 1834 book by Joseph Adshead which describes the Rothsay Castle wreck. Jean Hood's book, includes story of the Rothsay Castle shipwreck. I came across the beautiful place of Penmon last year. We returned with the family a few weeks ago and completely haunted by the many stories of tragedy and the many souls who lost their lives. Could you please tell me where i can purchase Jean Hoods book from and are their any other books related to the local history of the shipwrecks. Many thanks Rachel. Trying to contact Geoff Hall. Interested in your post on the Anglesey website about this shipwreck. I wondered if you could tell me more about the Duckworths who were involved. I believe they travelled in a party from Bury with a single man named Thomas Entwistle, son of Lawrence Entwistle of Grime Cott. I have looked on Ancestry in the past to try to find these people, especially wondering whether either of the female Duckworths were Thomas's sisters. I am a member of the Entwistle Family History Association and I produce the quarterly newsletter. Last September I included an article I'd written about the shipwreck, focussing as much as possible on the Entwistle connection of course. I'm attaching this newsletter to another email. I'm reminded of this story because we were in Anglesey last week and went to look in the Beaumaris St Mary and St Nicholas churchyard for the tombstone mentioned in my article, or, indeed, for anything at all about the Rothsay Castle. Found nothing there. Wonder if this was the correct churchyard? This morning I received via Amazon a copy of Jean Hood's book containing the story of the wreck. Lots of detail but only one mention of Thomas Entwistle. I realise your post on the website is quite a while ago! We went last week to the churchyard (St Margaret & St Nicholas) in Beaumaris and looked for memorials relating to the Rothesey Castle shipwreck. Principally interested in graves of Thomas Entwistle and the two Mrs Duckworths. Didn't find any mention of Rothesey Castle. Were we looking in the correct graveyard? Rothsay Castle - "Harriet Thompson"
Yes, there is a memorial to John Thompson's wife. "Sacred to the memory of H.T. youngest daughter of the late Samuel Skelton, Esq. of Bradford, Yorks. who together with her husband John T., Esq. Solicitor of that place, unhappily perished in the wreck of the Rothsay Castle Steam Packet, near Puffin Island on the 17th. Aug. 1831. Her relations who can never cease to lament her kindness of disposition & amiable qualities of heart had the mournful consolation of attending her remains to the grave & of paying the same last tribute of earthly regard to those of her husband which were found on the Lancs. coast & interred at Formby in that county." Whilst 'looking up' the ship, I came across your account of John's headstone - most interesting. i did a protect few years ago on the rothesay castle for my art exam .i also went to st catherines church were my parents are buried. i found the grave of a brother and two sisters. casualties of the rothesay castle..but when i went again to pay my respects ... i could not find the grave .wondering if a new head stone has be erected.??? During the summer of 1980 while searching for a sunken pleasure craft in the Menai Straights I stumbled across the wreck of the Rothsay Castle. I had previously read about the sinking of it, so when I found her, it was immediately identifiable due to it's unique shape. The wreck had initially foundered on the north-east side of the Dutchman's Bank, at some point, either during or after the storm that sank her. She drifted off the bank and into deeper water, probably aided by the strong currents of the Menai Straights and finally coming to rest at the bottom of the channel opposite the coast guard station at Penmon Point. She lies in 60 feet of water on a soft sandy seabed with her bows pointing up the straights towards Bangor. Most of her upper works have rotted away leaving the keel, spars and areas of her hull intact. What makes her identifiable is that the stern section is completely intact with it's raised stern castle including the two access stairs port and starboard. On the top of the stern castle deck the planking is in good condition. The leading edge of the stern castle still has a cast bronze guide in place which fed the steering chains to the rudder. Aft of this guide about 5 feet is an open hatch combing which was probably glazed and this looks down into the accommodation below. This has filled up with sand to about four feet below the underside of the deck. Who knows what secrets this sand hides? By far the most important identification marks are the two cast iron paddle beds which lie approximately at the mid-point of the keel. Although I never took any accurate measurements of her length I would estimate her remaining length to be around eighty feet, the bow section I believe is missing. I alway intended to return to her one day but never got around to it due to commercial diving commitments. I will always remember the eerie feeling swimming around that wreck knowing that I am the first person to visit her since she sank. Many thanks Mike, for sharing your experience of diving around the wreck off penmon Point. she is buried in the graveyard near the top of the great orme. near to the church. she was aged 31. and came from bury lancashire, or greater manchester as it is now. she was drowned in the wreck of the ROTHESAY. august 1831.
buried seperately from her 2 years old son. Having done a circular walk from Henlley hall near Beaumaris, my wife and I came across St Catherines Church in Swn y Cloch and had a stroll around the grave yard. I came across a grave stone with the inscription "Beneath lie the remains of Owen Owen,B.D.Fellow of Jesus College Oxford forth son of Owen Owen of Glynafon Esq.in the county of Anglesey, who with his Sisters Margaret Edmunds & Mary Dorothea on his passage from Liverpool was taken to his rest in the calamitous Wreck of the Rothsay Castle Steamer,about 2 a.m, Aug 18th A.D 1831 O.O. AEtat.33.M.E.O.AEtat 29.M.D.O. AEtat.21." Further inscription from a verse from the bible followed the above. I was so intrigued as to the events leading to the disaster I found your web site and got my answer. May the souls above R.I.P. Just to excercise my 'bragging rights'..Ted Woodalls, in Valley or Dyffryn, near Holyhead is related to me. His granpa 'Fireman' Isaac Woodalls was lost on the SS. Connimarra. To avoid confusion his father was also of the name 'Isaac Woodalls' working in Holyhead and his wife of late, a divorcee from my Gt.-gt. grandfather, was Annie Jane ( nee Gunn ex Mrs. Stubbs Lambert, divorced. She was the daughter of Sgt. Nathaniel Gunn B. 1808 -.. from Bower, Caithness, serving in the 93rd Highland Rgt of Foot and was based at Fermoy Barracks in Fermoy in Cork County. He retired 1855 and lived in 'Cefn Gwyn' a fatm in Caernarfonshire. My great great grandfather survived the Rothsay Castle disaster. Just as wee, or I would not be here to write this. This is an inscription found on a tombstone in St Peter's Churchyard, Formby. Here lieth the body of John Thompson/ Bradford Yorkshire Solicitor 13 years/ which was washed ashore on this coast on/ 1 Sept 1831 (sic)and his wife were/ passengers on the Rosthay Castle/ Packet which was wrecked near Puffin/ Island in the Bay of Beaumaris on/ 17 August 1831. The body of his wife was picked up/ near Beaumaris on 29 August 1831 and/ interred in that place on the following day. It is a large rectangular sandstone lying flat. There is also a partly legible single line verse. Two points of interest - 1. the corpses washed up at this time - and there were large numbers - were usually interred on the north side of the church with no tombstone. John is buried near the entrance gate. 2. If he was a solicitor surely he had sufficient funds to pay for a burial back in his native Bradford - although the owner of the packet was asking £5 to repatriate corspes to Liverpool, a considerable sum in those days even for a solicitor's family to find. It is understandable that his wife, Harriet, had to be buried in Beaumaris - is there a memorial to her in the churchyard there? Yes..what an absolutely 'flawless' accident ! The SS.Connimara was a very pretty ship, really neat looking with a fancy stern like the Titanic had.. The dead livestock and victims washed ashore, not a pleasant sight for the Irish. I think the incident you are talking about happened near Carlingford Lough, in Northern Ireland. The Connemara was making her way to Holyhead in very rough seas. Amazing what you say about the rudder breaking on Retriever. bet you couldn't do what happened that night if you tried a thousand times. what a fluke! Another wreck, that of the SS Connemara a Holyhead passenger ship with crew wholly of Anglesey men and one or two from Bangor, lost in 1916 when the Irish ship SS.Retriever lost her rudder in a heavy storm, and in a circular pattern, rammed into the starboard beam of the SS. Connemara, the bows slicing into the Connemara "all the way to the funnel." Of the two ships there was only one survivor perchance, off the SS Retriever. Lost to the family was Isaac Woodalls a "Fireman" ( stoker ) His grandson Ted Woodalls lives in Valley. The Rothsay sounds more than godawful with the time taken so torturously. That and the account of Watson's indifference to it. I have written a 20,000 word account of the disaster in my book "Come Hell and High Water" (paperback title is "Wreck" published 2006/2007 by Conway. I didn't have room for the passenger list in the book but you can find it on my website www.jeanhood.co.uk. It isn't an official list but I put it together from the various newspaper reports and lists. That is very interesting, Geoff. Can you tell us more about what you know? Have you got personal accounts from the survivors? 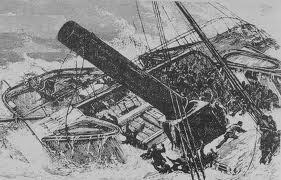 Two of my male relatives and their wives were involved in this shipwreck. The two wives Elizabeth Duckworth and Mary Duckworth were both lost, but their husband's survived.